Something straight out of the glory days of televised poker: Hellmuth vs. Matusow heads up. Ordinarily, a side event at the World Poker Tour L.A. Poker Classic where a couple of players pocketed less than $40,000 in prize money would be the tiniest of blips on the poker radar. When those two players are Phil Hellmuth and Mike Matusow, however, it's big news. The old rivals clashed heads up in the $1,100 Omaha Hi-Low/Stud Hi-Low event, much to the delight of railbirds everywhere. Hellmuth has over $21 million in live poker cashes, one of the top figure of all time, while Matusow is at a hair under $10 million. Despite the relatively piddling monetary stakes compared to some of their historic battles — the two have gone to war on High Stakes Poker for thousands of dollars per hand — both players undoubtedly wanted the victory for bragging rights. Both had navigated to the final table of the 72-player field, with Hellmuth coming in almost tied for the chip lead while Matusow was one of the shorter stacks, according to the live updates. Fellow old-time legend John "Miami" Cernuto also made the final table but busted early. Matusow worked his way up to second in chips, while Hellmuth maintained his lead. 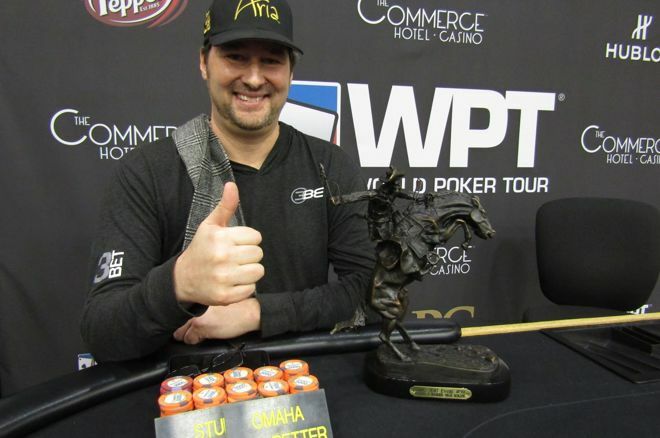 When Hellmuth eliminated George Rechnitzer in third place, something straight out of the glory days of televised poker had come to fruition: Hellmuth and Matusow heads up for a tournament. Matusow bet sixth and got a call before betting on the end. Hellmuth popped in a raise and Matusow cursed and folded, leaving himself crumbs behind. He busted out moments later, taking $14,400 in prize money. Hellmuth, meanwhile, pocketed $25,200 and a trophy, but perhaps most importantly, the latest round of bragging rights in one of poker's great rivalries.